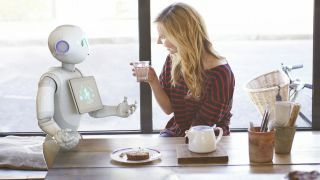 According to new research from professors at Tel Aviv University, robots must learn the right "social cues" and polite mannerisms in order to be able to successfully interact with human beings. The study was specifically looking at the potential of robots as diplomatic peacekeepers - putting them into situations where a human being might be at risk of abuse or attack. The scenario used was a humanoid robot in charge of inspecting people entering a building. The volunteers who took part were asked their first impressions of the robot based on its level of politeness or rudeness, which was adjusted over time: it turns out both were closely linked. In other words, we're much more accepting of a robot telling us "your name's not down, you're not coming in" if it's polite about it. These social mannerisms must be built into robot AI if they're to eventually replace humans in these situations, the study suggests. "Interactions between machines and people should follow rules of behaviour similar to the rules used in human-to-human interaction," said Joachim Meyer, one of the report authors. "Robots are not seen as mindless technology; rather, they are considered agents with intentions." The research found that robot rudeness was perceived equally negatively whether it was directed to an elderly or young person, something that wouldn't necessarily be the case in real life.